Frickley Athletic manager Spencer Fearn hailed his wounded heroes as they dug in to turn the club’s fortunes round with a 2-1 success against Spalding United in the Evo-Stik East Division. The Blues were once again down to bare bones before kick-off with several players patched up to play although not fully fit and a bench made up of under 21s to cover the outfield positions. They then suffered more injuries during the game and after going a goal down it was looking like being the same story as in recent weeks. 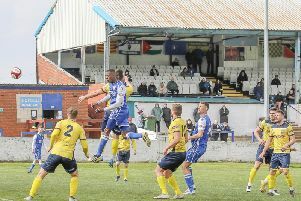 But up stepped young striker Lewis Szanto, who broke Frickley’s goal drought which had gone on for more than seven hours of football and bagged a second to complete a thrilling comeback that brought a welcome three points for the Blues. “The injuries are just piling on, but Szanto’s come on and what a header for the first goal,” Fearn said. “We’ve got the win, we needed it and it’s been tough. It’s a constant battle at the moment, but when the chips are down we come out fighting. “You talk about team spirit a lot when you’re winning games, but it’s about team spirit when you’re losing – and that’s what these lads have got. It was wave after wave, we got the goal and stuck to what we were doing. Spalding had the first chance only to be denied by a great block from Jameel Ible, playing a headband after his recent injury. Jacob Hazel had several sights of goal at the other end, but it remained goalless to half-time with the Blues already having to make a substitution with Teddy Bloor injured. Connor Smith had his decent display halted early by another injury following a bad tackle after the break and Spalding took the lead just after the hour mark as Luke White netted. But Szanto proved a super sub for Frickley as sent a powerful header into the net for an equaliser on 82 minutes from Hazel’s corner. Seven minutes later Szanto challenged for the ball in the box after Ben Algar’s cross had been touched on by Ible and the ball ended up in the net. Cue big celebrations and relief as the Blues had their vital three points. Frickley now turn their attentions towards cup competitions this week as they take on Skelmersdale United in the preliminary round of the FA Trophy on Saturday and Shelley away in the first round of the Sheffield & Hallamshire Senior Cup next Tuesday. Venue for the Trophy tie has been switched because of Skelmersdale’s ground sharing agreement with Prescot Cables, who are at home on the same day, and it will now be played at Westfield Lane, kick-off 3pm. Frickley should have two players back with Phil Watt available again after a three-match suspension and Dan Palmer in line for a recall if he comes through an under 21s match. Sam Liversidge is still a few weeks away from returning while James Gray is continuing his rehabilitation and how long Connor Smith will be out is unclear. Frickley, meanwhile, are pioneering an interactive feature in their matchday programme to tie in with the club’s player of the month award, which has been sponsored by Bowlands Brewery. Each month there will be an award for the player who has gained the most votes across the month using the new interactive feature in the programme. September’s player of the month is Tyler Walton.